Poha Berry, aka Goldenberry, Cape Gooseberry, or groundcherry is a small bushy perennial shrub from the nightshade family. It's native to South America, Chile, and Peru but is found and cultivated elsewhere for it's delicious and yummy orange fruit! Poha Berry grows in a variety of conditions, thriving in high humidity or in high altitude areas, growing in marginal forest areas and riparian woodlands/jungles. It can be grown in temperate climates as an annual. 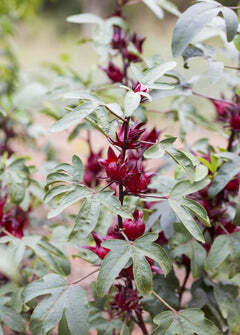 The plant will fruit berries that grow in paper like 'calyx' which are thin skin-like outer coverings. These berries are delightfully vibrant orange! The fruit tastes tangy and sweet, like a mixture of pineapple and strawberry. It can be used to make jams, ice creams, alcohol, and other awesome edible curiosities! The orange is not deceiving! Poha berry is high in vitamin C and contains a good dose of beta-carotene the same phytochemical that gives carrots their orange flair. Poha Berry also contains thiamin and niacin (found often in energy drinks) and phytosterol compounds that help promote higher levels of energy and focus! Mature Size: Up to 4 ft tall with a wide spread of up to 7 ft in ideal conditions. Climate Zones: USDA plant hardiness Zones 8+. Can be grown in temperate climates as an annual.